Watching the 2019 World Champs’ mogul and aerial finals live from the base of the course is a bucket list experience. You can’t go wrong by attending the event. However, to make your night the best night ever, there are a few things you can do to improve your time as a spectator. There is a security checkpoint so getting on the hill will take a bit longer than usual. Leave your bag or backpack at home; people without bags will be given priority at the checkpoint. So put your wallet, phone and lip balm in your pocket and bring only what you absolutely need. Check the times of the events on the calendar – here. 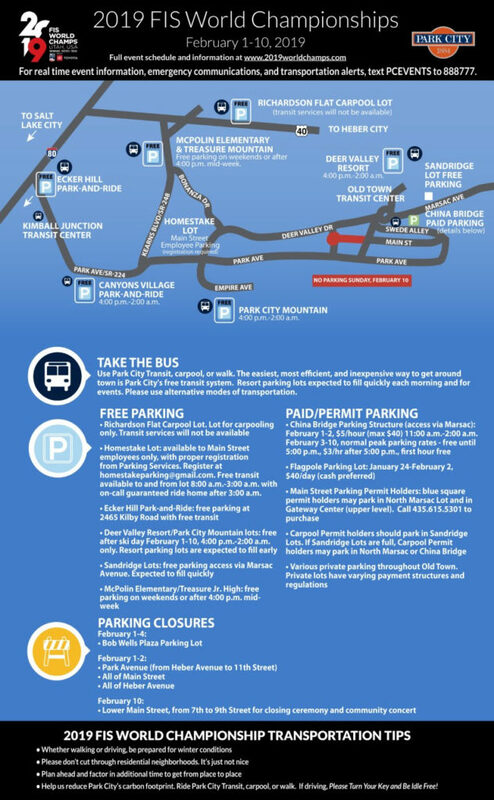 Take Park City Transit (free buses) to the Main Street transit station and then jump on the bus to Deer Valley Resort. The bus will be full of other spectators excited to attend the event. More helpful transpertaion tips to the events can be found on the flyer below. After the competition, stick around to avoid the rush and grab a bite to eat and a libation. 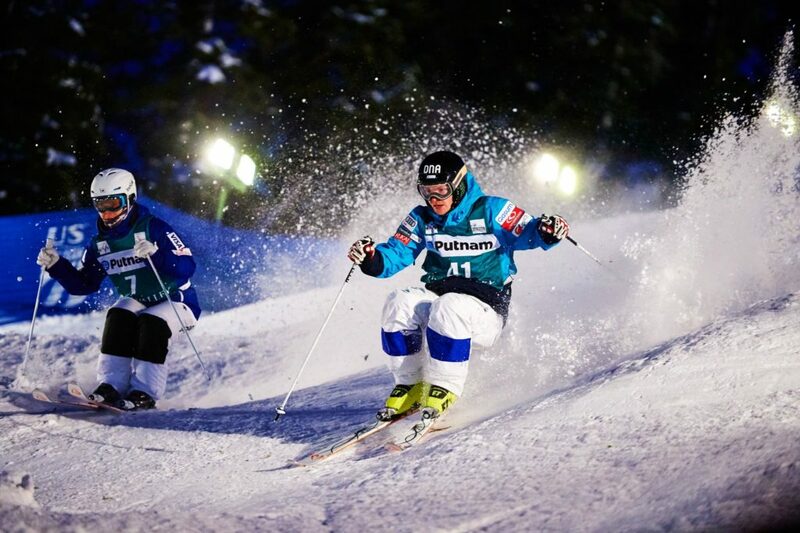 The EBS Lounge at Deer Valley Resort has extended their hours during the evenings of the events. From February 6th to the 9th, they will be open until 10 p.m.
A live stream will also be playing during the event if you’d like to watch it from there. 3. Get a lift up. The walk is easy up Wide West to the base of White Owl and Champion ski runs but you don’t have to walk the whole way. The moving carpet-style conveyor lifts and the Snowflake chairlift are open for you to catch a ride. 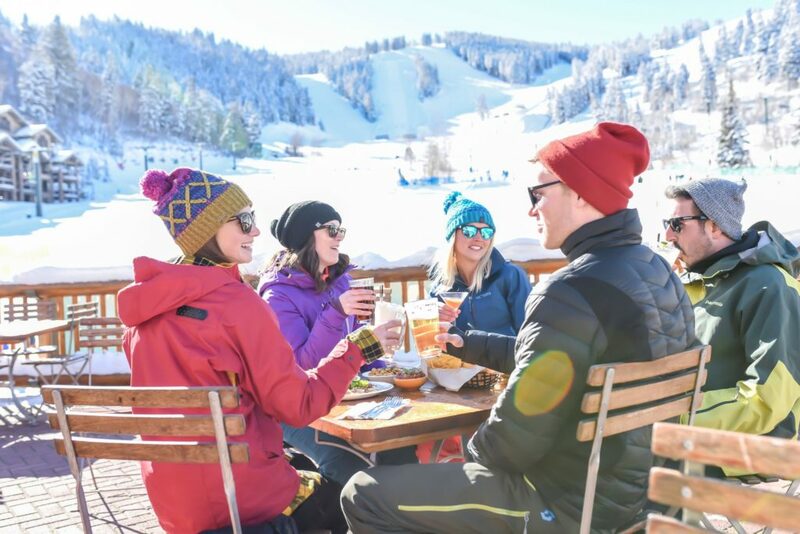 Instead of walking the entire way from Snow Park Lodge, rest your feet and make it part of the experience to use services you can usually only use with your skis on. The mountain gets chilly at night so be sure to bundle up. Locals bring hand warmers as well as their beanies and warm gloves. The event will be much more enjoyable when you are toasty warm. Wear shoes with some tread on the bottom. After the event, you’ll be headed downhill with thousands of your closest friends! Skip the slick shoes and choose your hiking boots or snow gear with some grip. The competition is exciting and it’s fun to post on social media and to share with family and friends. Be sure to fully charge your phone so you can post selfies and videos to your heart’s desire. Follow the World Championships event on Twitter at: @UtahWorlds2019. 7. Smile for the camera. The event is nationally televised so chances are, your smiling face will be in many crowd shots. Bring your biggest smile and wave to the camera and all the folks watching back home. Standing at the base of the course and watching world-class athletes compete for the podium is an experience that gives you goosebumps. It’s so exciting! Come out, support the athletes and have the best time of your life. What channel will air the championship? On what date? Here is a link to the broadcast schedule in case you can’t make the event in person. All great suggestions. Thank you Nancy and Deer Valley!